Today I’m sharing a pretty rainbow lunch that I made for Small Child recently. I absolutely love adding bright rainbows of colour to his lunches with all natural ingredients – I feel so lucky that we have so many amazing fruits and vegetables available to us. This post includes a simple rainbow tortilla wrap recipe and easy rainbow skewers recipe too, both of which make great healthy lunch box food ideas! 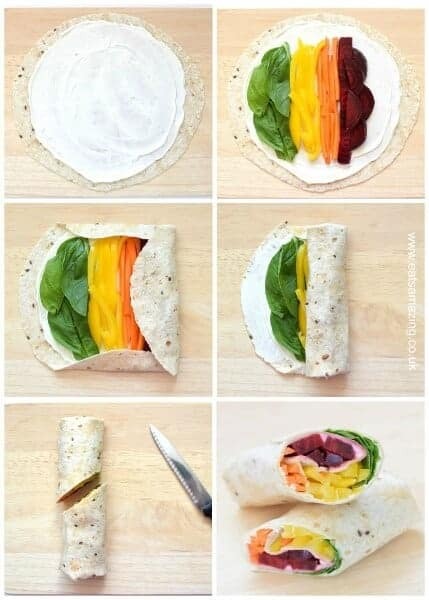 To make this lunch, I first made the rainbow wrap. I used a multi-seed tortilla wrap, but you could use any type of wrap that you like. I find that making wraps like this gets Small Child to happily eat vegetables that he would normally reject – he wouldn’t usually eat the spinach if I put it straight on his plate for example, but he didn’t even mention it when he ate this wrap, and seemed to thoroughly enjoy it! Place the vegetables on top of the cheese in layers as shown in the photo above. Fold up the top and bottom of the wrap, then tightly roll, spreading a little extra cheese on the last bit of wrap to help ‘glue’ it in place if needed. For dessert, I also packed rainbow fruit skewers. These are so simple to make, and you can swap the fruits in and out to suit your tastes. Why not get your children involved in making their own rainbow skewers – you’ll find a similar recipe with a free printable child friendly recipe sheet on this post: Rainbow Fruit Skewers Recipe, so they can follow the recipe themselves, great for building confidence for beginners in the kitchen! For these skewers I cut bamboo skewers in half, then threaded on blueberries, red and green grapes, clementine segments and raspberries. Here’s the whole rainbow lunch, which I packed in our Polar Gear bento box. In the bottom layer I packed the rainbow wraps, plus a hard boiled egg which I shaped into a star using one of our egg moulds, and popped into a star shaped silicone cup to hold it in place. In the top layer I packed a square silicone cup filled with slices of carrot and a couple of small chocolate coins ro represent a pot of gold at the end of the rainbow, plus the rainbow fruit skewers of course. Small Child ate every last crumb of this lunch, and said that he really enjoyed it. I was please because it went a long way towards his 5 a day that day! If you liked this post, you might like some of the other rainbow recipes that I’ve shared here on the Eats Amazing blog! You might also like to follow my Kids Lunch Box Ideas Pinterest board for loads more lunch ideas from all around the web! 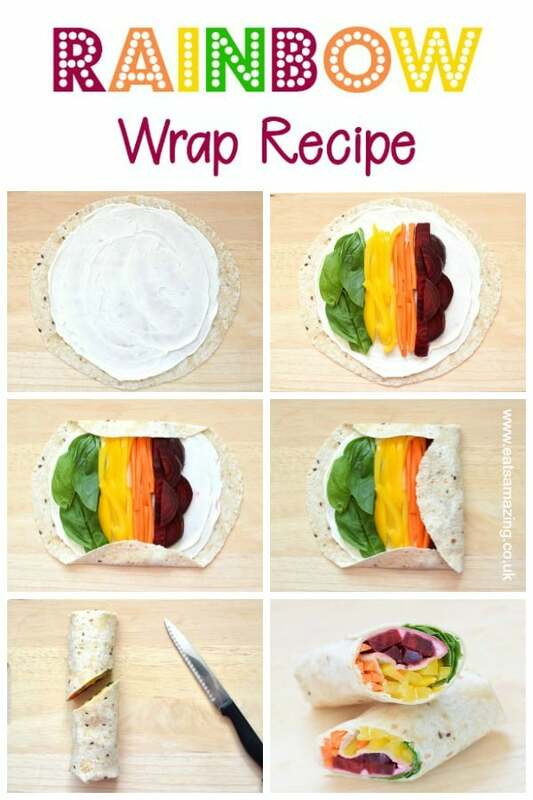 How to make a rainbow wrap - this step by step rainbow tortilla wrap recipe is a great healthy fun food idea for kids packed lunches and bento boxes! Place the vegetables on top of the cheese in layers as shown in the photo above. Fold up the top and bottom of the wrap, then tightly roll, spreading a little extra cheese on the last bit of wrap to help 'glue' it in place if needed. 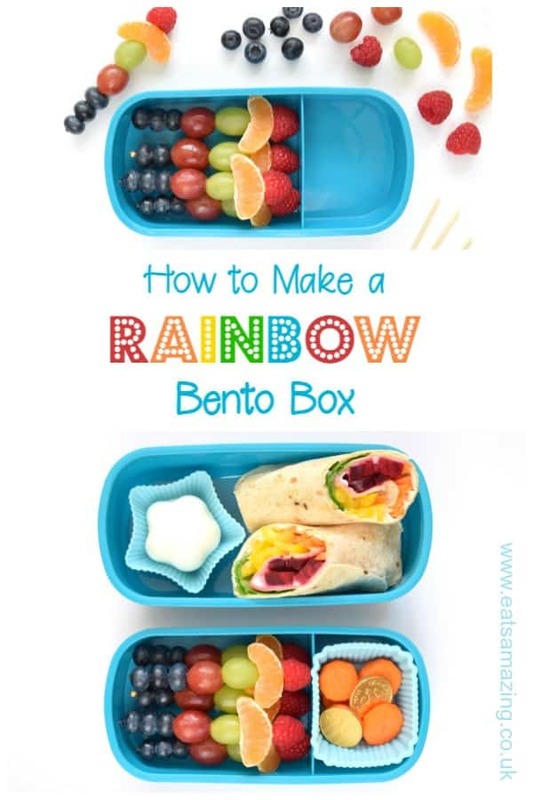 I hope you will want to try this fun rainbow lunch, please pin it if you do! For more healthy rainbow food ideas and recipes, check out the rainbow food ideas section here on the Eats Amazing blog or follow my Rainbow Food Pinterest board for fun rainbow ideas from all over the web! What a great idea. I’m sure it would bring a smile to any child (or dinner lady) at lunchtime. Very nice pictures ! So helpful too. Thanks for your post. Anyone could be able to wrap after this ^^.